1.5 Is the ANOVA F Robust? This revised book provides a thorough explanation of the foundation of robust methods, incorporating the latest updates on R and S-Plus, robust ANOVA (Analysis of Variance) and regression. It guides advanced students and other professionals through the basic strategies used for developing practical solutions to problems, and provides a brief background on the foundations of modern methods, placing the new methods in historical context. Author Rand Wilcox includes chapter exercises and many real-world examples that illustrate how various methods perform in different situations. 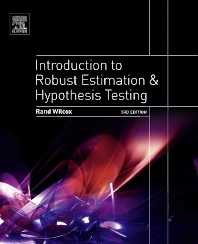 Introduction to Robust Estimation and Hypothesis Testing, Second Edition, focuses on the practical applications of modern, robust methods which can greatly enhance our chances of detecting true differences among groups and true associations among variables. "This text focuses on applied aspects of major modern and robust statistical methods. Early chapters explain the aims and mathematical foundations of modern methods. The heart of the book describes methods for addressing common problems in ANOVA and regression, with a minimum of technical details, and judges their merits using multiple criteria, giving advice on which ones to use for various situations. Chapter exercises are included. The book assumes a previous introductory statistics course and background on basics of ANOVA, hypothesis testing, and regression. For this third edition, S-PLUS functions are no longer supported. Instead, R functions are supplied." --Reference and Research Book News, Inc.
Rand R. Wilcox has a Ph.D. in psychometrics, and is a professor of psychology at the University of Southern California. Wilcox's main research interests are statistical methods, particularly robust methods for comparing groups and studying associations. He also collaborates with researchers in occupational therapy, gerontology, biology, education and psychology. Wilcox is an internationally recognized expert in the field of Applied Statistics and has concentrated much of his research in the area of ANOVA and Regression. Wilcox is the author of 12 books on statistics and has published many papers on robust methods. He is currently an Associate Editor for four statistics journals and has served on many editorial boards. He has given numerous invited talks and workshops on robust methods.